Hello first time post here and will be reading many past threads to absorbs as much information as I can. 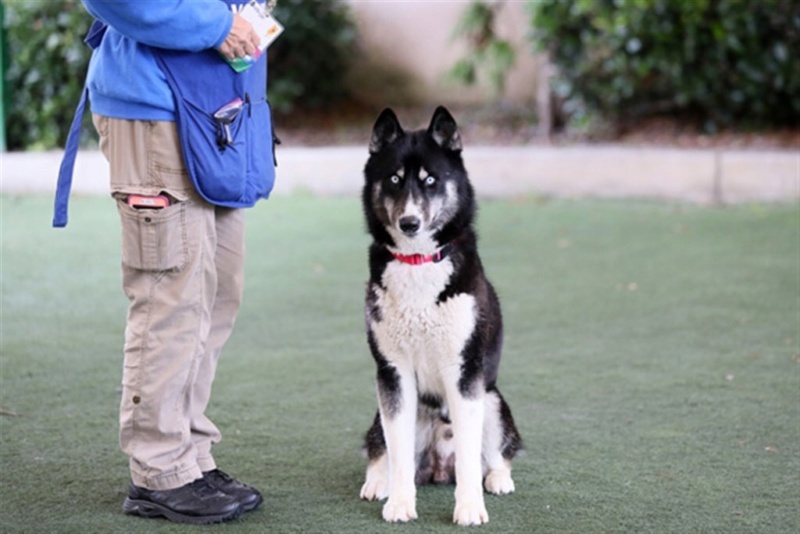 3 days ago we welcomed an estimated 2 yr old husky mix. He has passed through several homes since he was brought in as a stray. Some issues reported are high prey drive and cant be trusted with small animals. He is an escape artist and has destructive separation anxiety. He is not potty trained. He has some resource guarding issues and can jump and nip alittle. He is hit or miss on if he will tolerate different dogs. He has barrier aggression crates, walls, and leashes. We believe his name will be Hannibal as he knows no other name at this point. Hannibal will be joining our family in a 2 bedroom condo no yard. My 7 yr old daughter has asked for a husky since she was 3 yrs old and finally got her wish. Hannibal with have a 4 yr old golden retriever to play with also. 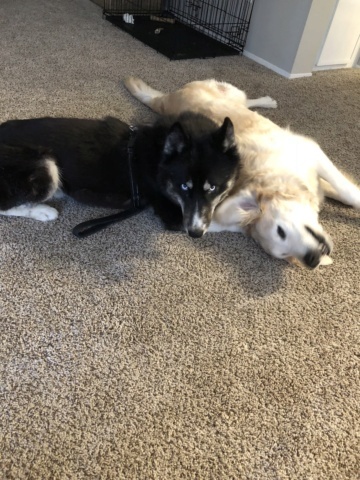 The trainer at the rescue felt comfortable with the interaction of our dog with the husky and we brought him home. The trainer also seems concerned on the separation anxiety and talking to the vet if he will need medication. I am hoping to avoid having to medicate Hannibal. So far he has had many beach walks and seen many things. I have read tonight the 2 week stay in for a new dog. I don't know if I am causing an issue from not doing this. Was treating him as I did my rottie and just exposure and working through all the new. Not sure what behavior to tackle first so just been weaving in training as they occur. He has made progress since arriving and has surprised me on many situations. So smart and thankfully highly food driven. Nervous over leaving him alone. Thankfully he has stopped howling and digging if I leave the room with his crate. Should be a fun adventure and look forward to learning more. He's a good looking boy. Handling things as they come is the proper way to go about it. Establish the rules of the house from the start, whose stuff is what, where you can't go, no counter surfing, potty training, etc. But you have to handle the other stuff as they come. If you put addressing a bad behavior off when it happens because you aren't ready to start that training then you will have sent a message that it's okay to do whatever that is and you definitely don't want that. Tiring him out before putting him in the crate can help with the anxiety. I always leave a radio on while I'm away. Dogs are used to having noise like a radio or tv running when we are home so when we are away they seem to do better. Makes it seem more like we just stepped out the door and will be right back, nothing to worry about. Here is a link to our sticky on crate training. It has a lot of what has worked for members over the years. Welcome. Your new guy is one handsome dude! Ditto what Jenn said - decide on the house rules and correct any behavior that deviates from those rules as it occurs. Congrats, beautiful pup:) Just an observation but 95% of the problems I see in groups like these are caused by lack of exercise. Figure out how to wear your new friend out, exercise - both physical and mental- are so very important to this breed. Good luck and enjoy the ride! Thanks all for the kind words. We are in southern Cali so won’t be able to leave in car for very long. He also freaks out a little. I am thinking it is just isolation anxiety. He doesn’t know us well and even the first day freaked out when alone for a moment. He has crate training already and only gets upset when alone even with sounds and Kong’s stuffed with goodies. Had some luck with having the other dog with him. Hannibal only seems to freak out if I leave or if I take the other dog with me. So I have started getting my husband and daughter more involved in his training. He is probably getting 4 to 6 hrs of fast walking. He tires out and needs breaks so imagine he wasn’t doing 10 mile walks as was said from past home. My husband is going to try skateboarding with him as some more exercise. He was neutered later in life so has to lift his leg often and seems to save it so has made potty training difficult. All of my male dogs were neutered before they learned that so was wondering if any had advice on how to get him to go all at once and not need to mark. I have read mixed reviews on just walking him and not letting him mark and others saying it could make them more anxious. Also any potty accidents have been him specifically hiking his leg only on my daughters stuff. So confused if he is marking or an accident sorry new territory here. Positives no counter surfing and taking to the rules great. He is learning his name more. He has learned sit, down, come, and crawl. Working on over and a stronger wait and stay. Very smart and been blessed with another food driven dog. He had a great time at doggie daycare and found some pals to play with. They hope to see him again. We took Hannibal to our weekly food and arts fair a lot of kids, people, food, and dogs he handled it great and will be becoming a regular. Many more adventures to be had and looking forward to learning more. Thinking of doing a dna test to see what he is mixed with. Haven’t seen any that look like him. This is Hannibal relaxing at the food fair. Husky --- food fair --- relax for some reason those just don't seem to go together. Bet he provoked a lot of attention at the food fair!! I'm not too certain that he's mixed with much. Husky colours allow everything except merle so your black on white really isn't that unusual. I must say, he is one striking dog. I think my guy was neutered later as well, because he has always been quite the marker. He will never pee it out all at once, and doesn't even like to pee in our own yard or preferably, not our own neigborhood! He prefers to spread "pee-mail" along our walking loops. I have rules about it - i.e. no flower beds, no mailboxes, and not on grassy front lawns - a light nudge with leash or a verbal "not there" will usually do the trick. Bushes, undergrowth, leaf piles, pine needles, the grass at the curb - those are OK. We avoid the ritzy manicured neighborhoods because there's nowhere safe to pee! Our other dog is a female and no accidents. We just moved here a few months ago. I know they replaced the carpeting. The marking was on daughters new bed, her tent, and her chair. I had her walk him leashed through the home and have her work with him on obedience. Hoping it will establish her as a part of his routine. Took him a minute to listen but he caught on she had the food and he was going to have to work for it. Could see him smelling her and full attention on her because she is young and movement was random. Working on cleaning up his coat. He has very dry skin. Still deciding on best food to give. The adoption place had him on pro plan. He was feeling under the weather and tummy issues. So has been on chicken and rice with some pumpkin. No marking past few days since daughter started working with him. Hannibal has been enjoying walking daughter to school in the morning and seeing all the children and greeting them. 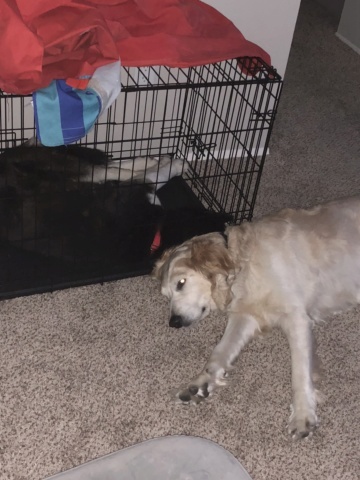 My golden and him have been bonding more and more each day. They are walking together better on the leash. He is doing better ignoring all the birds on the beach. Still working on cats and small dogs. Have been avoiding the small dogs to many bite my golden in the face locally and don’t want that to be the start of his introduction. Exercised Hannibal the other day got him really tired and had the golden near him and left the house for 10 min. Some fussing but he survived. Baby steps one day I hope it will be better. A good quality food will help with the skin. Most of us here feed something grain free. 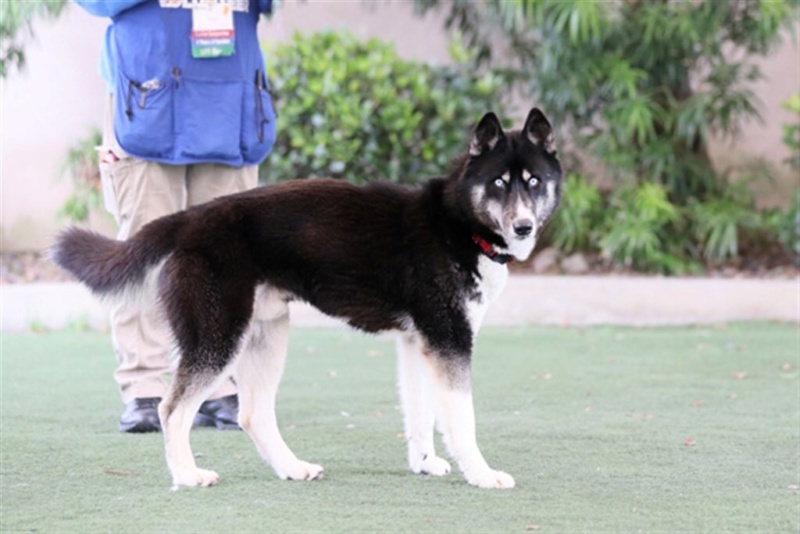 Huskies lack the levels of amylase in their saliva that some other breeds have that assist in the breakdown of grains, so they tend to do better on grain free. Taste of the Wild, 4 Health, Natures Domain are some common budget friendly grain free foods that members feed. For the skin you can look into moisturizing shampoos to help or massage coconut oil into his skin in the evenings. The coconut oil is good for dry skin but also for if he may have a touch of yeast buildup in the event he has allergies. I love the pic of the two of them lying together! It's sweet that your other dog has accepted him! And yes, the amount of lunging barking hostile small dogs we pass is amazing! I have one of those small lunging dogs. Him and spider are inseparable. I dont let my dogs meet other dogs even though individually 3 are usually ok with other dogs. As a group they get the pack mentality sometimes and thats when other animals get hurt or killed. On the rare instance i do walk my dogs they go out 1 at a time. It always scares me when people allow their animals to approach mine in public especially if i have squirt. 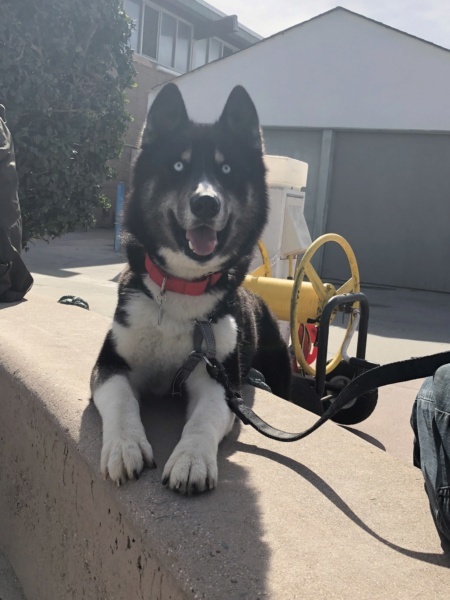 Subject: Re: New husky owner just rescued one.